The founder of the nation’s largest pool service franchise is getting into an entirely new business: Barbecue grills. And he’s tapping an unlikely source to get the product to market: College students. 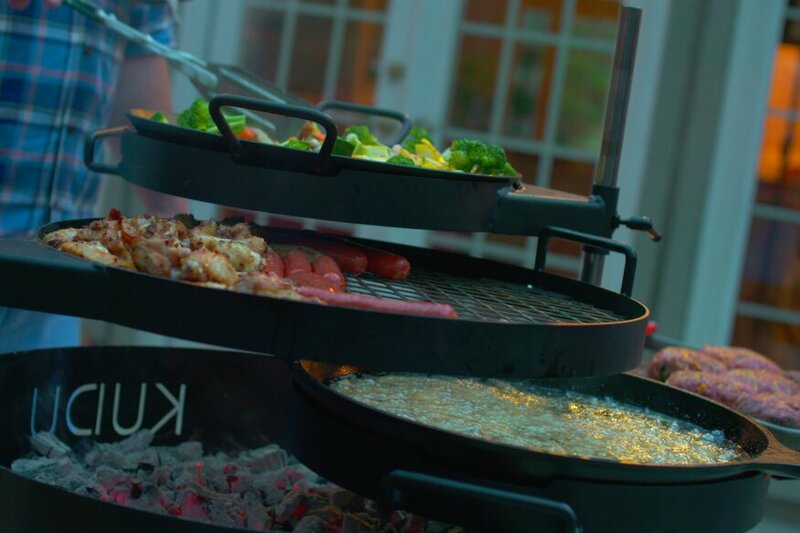 Stewart Vernon, CEO of Macon, Ga.-based America’s Swimming Pool Co., hopes grill enthusiasts go gaga over the KUDU Safari Braai, a wood-fired cooking system inspired by South African cookouts. As an entrepreneur-in-residence at Mercer University, also in Macon, Vernon is conducting a class this semester at the Stetson School of Business and Economics, where students will get hands-on experience marketing and distributing a product that Vernon envisions as the Next Big Thing in barbecue. “These students get to work alongside a true startup that is kind of groundbreaking in the grill industry,” Vernon said. 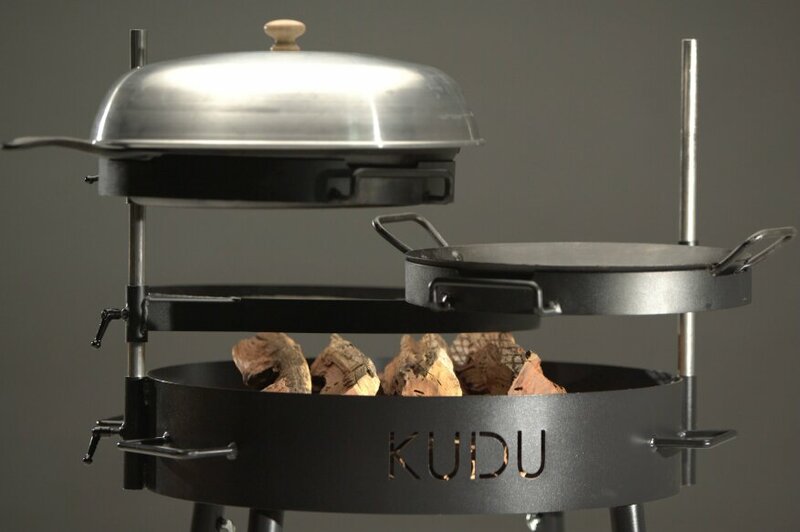 What makes the KUDU different is that it allows the cook to adjust the temperature by moving pots, pans and grates laterally on vertical poles over an open fire. For high heat, move the food closer to the fire. For lower heat, move it up. Multiple cooking components, which articulate on the poles, can be used at once. The party isn’t over when you’re done cooking. The KUDU doubles as a rudimentary fire pit. It’s a distinctly African way to cook, said inventor Stebin Horne – a Georgia native who spent six months in his wife’s home country of South Africa. He modeled his grill on the sort of cooking contraptions he saw field workers rig up with pieces of agricultural equipment. The KUDU Safari Braai is named after a species of African antelope, the kudu. The “Braai” in the brand is Afrikaans for roasted meat. Among South Africa’s 11 official languages, braai is the only word they all recognize, Horne said. It also carries significant cultural connotations. In South Africa, cookouts are a cherished pastime and almost always done campfire-style. Locals have a good reason for doing it this way. “There’s kind of this running joke in Africa: ‘Yeah, we could cook on grills with a cover, but the lions would eat us.’ The fire is what keeps the lions away,” Horne said. While there, he developed another uniquely sub-Saharan business, one that restores vintage Land Rover Defenders, the quintessential safari vehicle. Vernon, an angel investor, has a part in the company. When Horne shared his grill concept with him, the franchiser wanted a stake (steak?) in that business, too. Horne also has the backing of his alma mater, Mercer, where he earned a doctoral degree in law. He’s currently a fellow at the Mercer Innovation Center – the school’s business incubator – which awarded him a $20,000 grant to get the startup going. Students will play a key role in this. In addition to helping plan the manufacturing and distribution logistics, they’re also creating a buzz around the barbecue grill through social media, such as a Kickstarter campaign that aims to raise $100,000 by October. The funds will fuel further marketing efforts, Vernon said. Initially, the grill will be sold direct to the consumer through online channels, Vernon said. However, he’d like to establish a dealership network in 12 to 18 months. Much of those efforts will be focused on the pool industry. The KUDU will retail for less than $1,000. Nate Traylor is a senior editor at Pool & Spa News and Aquatics International.